For most of us, drinking wine always marks special occasions. A dinner date with your significant other calls for a glass of bordeaux. Wedding couples celebrate with their friends by toasting to prosperity with champagne. For corporate meetings, executives establish and seal business partnerships over a bottle of pinot noir or cabernet sauvignon. Wine connoisseur or not, customizing your wine labels can not only give relevant information but also lets the receiver know they are exceptional. Why don’t you make celebrating these occasions extra special by creating personalized wine labels with NextDayFlyers? You can choose from a variety of sizes as well as cut-to-size or roll forms depending on your needs. Use cut-to-size for more size choices or roll for easier application and storage. 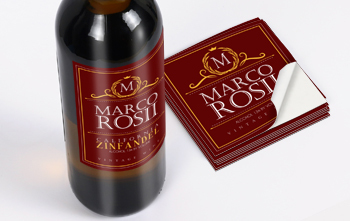 Our self-adhesive wine labels can stick to any wine bottle surface easily. Get your personal wine labels as soon as the next day with our quick turnaround time. Wine Labels is rated 4.2 out of 5 by 6. Rated 5 out of 5 by Woodys Originals Inc from Excellent company to work with. I've done a few labels with them I'm 100% satisfied. Rated 1 out of 5 by Chris9867809 from Honestly... not good The paper is way too thin, very little options. Ordered with vinyl cover, got regular. The size was bigger than ordered. Wish you had better options for the quality of wine labels and paper thickness. Almost a buck per label, should offer free shipping and made outside of the state to avoid paying taxes, specially California taxes. Will not order again. I can get that kind of label printed at home. Rated 5 out of 5 by revron from Outstanding product Everyone loved them and look forward to seeing what other products will be offered in the future.